The total market cap of publicly traded cannabis companies listed in the U.S. and Canada gained yesterday (April 10th) by over $1 billion to $71.443 billion. The cannabis industry's total valuation most recently surpassed $70 billion on March 8th and has remained above $70 billion for the last 24 consecutive trading days - a new all-time record! The previous record from October 2018 was only 5 consecutive trading days! Leading up to the October 2018 legalization of cannabis in Canada, cannabis stocks made their largest short-term rally in history, with investors driving the industry's total valuation up to an all-time high of $76.44 billion! After peaking on October 15, 2018 at an all-time high valuation of $76.44 billion, the cannabis industry lost 35.65% of its value in 10 trading days, declining to an October 29th short-term bottom of $49.19 billion. Afterwards, cannabis stocks rapidly bounced in value but were unable to break the key $70 billion level, peaking on November 7th at a short-term top of $69.54 billion. From the industry's November 7th short-term peak valuation of $69.54 billion, cannabis stocks got hammered down with the rest of the market, declining 36.81% over the following 32 trading days to a December 26th medium-term bottom of $43.94 billion. Since December 26th, the cannabis industry has rallied with the rest of the market, with cannabis stocks posting by far the largest gains in the market. 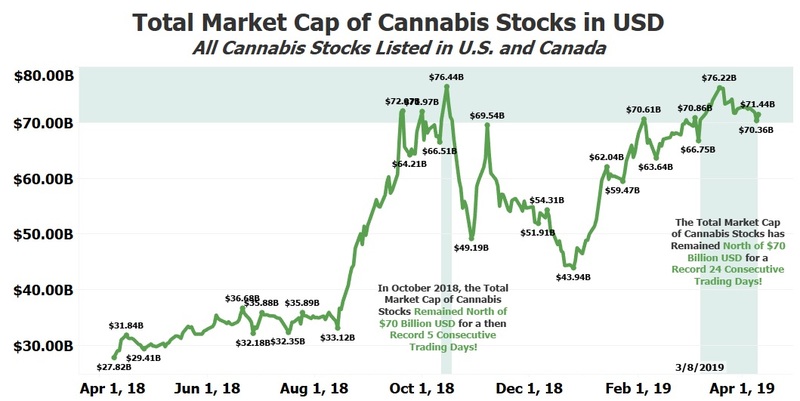 Between December 26, 2018 and March 19, 2019, the total market cap of cannabis stocks increased by 73.46% to a new five-month high of $76.22 billion. In comparison, the S&P 500 posted a gain of 14.79% during this same time period. The cannabis space rose nearly 5X more than the overall U.S. market! Although the cannabis industry hasn't yet surpassed its all-time high valuation of $76.44 billion set on October 15, 2018, we consider the cannabis space today to be much stronger than October. With countless huge catalysts ahead for the cannabis space between now and year-end, a new record high valuation for the industry is inevitable. When the total market cap of cannabis stocks surpasses the October record high of $76.44 billion, we believe this will be the "key breakout point" for a major leg upward - perhaps to above $100 billion this summer! As NIA's most recent new cannabis stock suggestion rose 92% over the past month, the total valuation of the cannabis industry remained flat. This proves NIA's ability to discover the world's most undervalued cannabis assets that have been overlooked by the rest of the investment community. In fact, we already proved exactly the same thing last month in the Cryptocurrency space, with NIA's #1 Cryptocurrency suggestion increasing in market cap by 80.84% vs. the total market cap of all Cryptocurrencies declining by 31.9% during the same time period!